Thanks to Barb Lester, we wanted to post this picture from the early 1980s. The South African Anti-Apartheid Working Group of the Institute for Global Education organized a protest outside a local company that was selling South African coins known as Krugerrands. In an early posting, we interviewed Rev. Doug Van Doren, who was heavily involved in the Anti-Apartheid campaign and during that interview he mentioned the Krugerrand protest. This protest was part of a a campaign that lasted years and saw many victories locally that contributed to the South African government ending the policy of Apartheid. 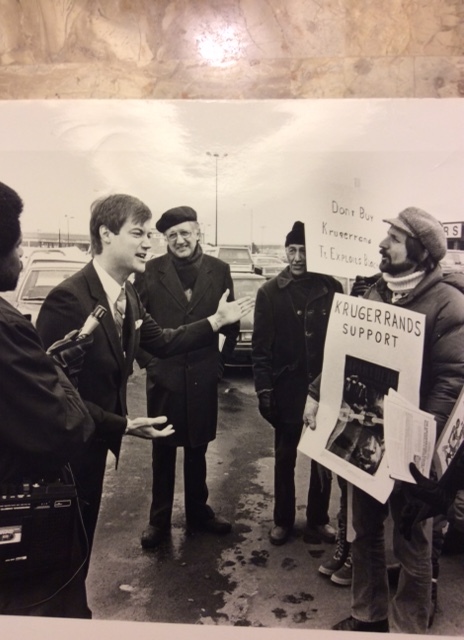 This entry was posted in Anti-Apartheid Movement and tagged Grand Rapids Anti-Apartheid Movement, krugerrand protest in grand rapids. Bookmark the permalink.